Casino history is a rich and very interesting study that goes back hundreds of years if not farther. In Venice, Italy in 1638 there was controlled gambling provided by the Great Council of Venice for the carnival season. Even before this, the Chinese were known to have elaborate games that some of our modern games are patterned after today. The first American casino history involved saloons that were in New Orleans, St. Louis, Chicago and San Francisco. Gambling in America had a long history of being allowed, being outlawed and then being allowed again. In 1976, New Jersey allowed gambling in Atlantic City following the pattern of allowing gambling in Nevada in 1931. Gambling took off after this and became something that millions of people would flock to and enjoy. And then, of course, online casinos started to sprout up with the technology changes in the 1990s, mobile came on the scene after this and the rest, as they say, is history. When did pokies become so popular and burst onto the scene? Pokies, you may be surprised to learn, have been around for a very long time. In 1891, Sittman and Pitt of Brooklyn, New York developed a gambling machine which was the beginning of the idea of the slot machine. Players would put in a nickel and pull a level and then they would hope for a good poker hand. Charles Fey of San Francisco then developed a simpler mechanism with three spinning reels that had five symbols and a Liberty Bell. The bell gave the machine the name it would keep, Liberty Bell. This was copied by many other companies and in 1907 Herbert Mills from Chicago produced a similar machine called the Operator Bell and the bell machines took off. This was the beginning of pokies history as we know it. Later, in 1963 Bally developed the first of the mechanical slot machine games called Money Honey. This included an automatic payout of as much as 500 coins without any attendant needing to be around to be helpful. There are gaming locations around the world for millions of people who love to play. The largest and most profitable of these locations include Monte Carlo, Campoine d’Italia, Macau, Portugal and Singapore. Of course, the United States is also a very popular location for pokies history and pokies gaming. Las Vegas tops the American locations for these activities, with Atlantic City in second, the Chicago area after this and New York City in fourth. Other American locations that have gaming are Detroit, Baltimore-Washington, Philadelphia, Mississippi Gulf Coast and St. Louis. It’s helpful, as you start to play pokies, to be familiar with the terms and language used when playing the game. While this is certainly not a list of all terms, it will get you familiar and offer you a way to get started. An active payline is one that is in play and if a slot has multiple paylines it allows the player to select how many paylines he wishes to play. Auto play is available on many games and means that the reels will spin automatically a number of times without having to push any buttons. The bet per line is how much you are wagering on each line. If there is a bonus feature in the game this would mean that you have a chance to move to another screen where you may win even more. These can either be triggered randomly or based on a certain combination of symbols. Free spins are a way to get to spin and potentially win and they are also awarded either randomly or by spinning a specific combination. The pay table is where it will explain the payouts for all of the various combinations of symbols. And a multiplier is a symbol that will multiply your payout. This is just an introductory list of pokies terms and there are certainly many more that you can learn along the way. Pokies have been around for quite a long time and they are a great way to sit back, relax and enjoy. 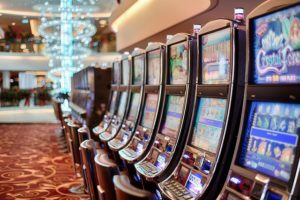 The casino history and pokies history around the world offers interesting insights into what people do in their free time, why they do it and how they do it. And it’s fun to connect ourselves to this historical knowledge as we get ready to play.